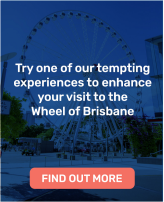 The Channel Seven Wheel of Brisbane is the ultimate destination for a proposal, an anniversary, Valentine’s Day, or just to say I LOVE YOU. Let Cupid’s Gondola set the perfect scene. We can also work with you to personalise your experiences so get in touch with us to book and let cupid take care of the rest.